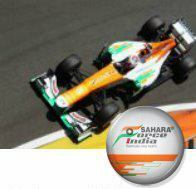 Dr Mallya, how satisfying was it to see both cars score points in India? Vijay Mallya: I was delighted with the double points finish; I don't think we could have done much better. The result was due to a combination of the small steps we've made optimising the set-up and some out-of-the-box thinking in terms of strategy. That's got to be the mantra for the next three races. VM: The last few races have been frustrating for us. Even tracks such as Monza and Spa, where we have traditionally been strong, did not work out well for us. But I feel that a lot of the frustration is now behind us, not quite all of it, but most of it. The car is working better and we seem to be heading in the right direction. It was another successful event as a whole for India. How important is it that Formula One returns to India in the near future? VM: India is an economy that cannot be ignored. This country has enormous potential, not just for Sahara Force India, but in terms of all the partners and stakeholders in Formula One. It's unfortunate that there won't be a race in 2014, but the promoter has assured me personally and also assured the Indian fans at large in media interviews that the race will return from 2015 on a sustainable basis. With that kind of optimism and forceful commitment all I can do is hope that it will return. What are your thoughts ahead of this weekend's race in Abu Dhabi? VM: We're certainly very happy that we got things right last weekend and there's no reason why we shouldn't be in the points going forward. Don't forget this team was a regular top ten finisher in the first half of the year, so we just need to recapture our old form. Our performance in India showed what we are capable of and there's no reason why we can't carry this through to the final three races. Paul di Resta: It's a well-earned result by everyone and very important for the team's hopes in the championship. We've had a tough run of things lately, so to get two cars in the points at the team's home race has given us something to smile about. After a tricky second half of the season do you feel more optimistic heading into this weekend? PdiR: We will certainly go to Abu Dhabi to try and repeat the performance. The direction we've taken with the car recently is more of a back-to-basics approach, which has helped. It's given me more confidence and I can be more committed with the car. That's really important for a driver and it will help us for both qualifying and the race. Abu Dhabi is a spectacular venue for Formula One. Do you enjoy the event? PdiR: I enjoy driving there because it's a twilight race and one of the more spectacular events of the year - a bit like Singapore. As a track you don't have to rely too much on aero performance because it's mostly low-speed and that should suit our car quite well. Adrian Sutil: I think the strategy we chose led us to the best result we could achieve. It just shows that if you try something a bit different you can come away with a good result. It was the riskier choice because the soft tyre was an unknown experience in race conditions, but I was able to look after it well and I still had strong pace in the last few laps of the race. How is the mood in the team after a strong performance at the team's home race? AS: We certainly needed some points and I think we are feeling more optimistic now. The car had a very nice balance in India - it was easier to drive, much more consistent and that helped us achieve the one-stop race. With both cars in the points everybody is feeling more positive going into this weekend. What about your thoughts on the Yas Marina circuit? AS: It's one of the most perfect tracks on the calendar because there's not a stone out of place! It almost feels like a futuristic venue and with the harbour location it's like a second Monaco. The track layout is not my favourite because it's mostly low-speed, but as an event it's certainly a highlight of the year.